I need to have a talk with some of you guys–pumpkin recipes already, pumpkin?! Shoot, I’ve got fresh ears of corn and tomatoes ripening every day in the garden. It might be mid-September, but there’s still stone fruit to be baked into pies and eggplant to be baba ganoushed. Pumpkin soup, pumpkin scones, pumpkin lattes, even pumpkin beer–I love you, but I’m not ready for you yet. Sweet corn soup, though? You betcha. Like others have said, this really is one of the most unique times–the temperature has started to cool off up here in the mountains, but it’s still warm and sunny in the afternoons. At the market, I picked up some of the season’s last corn as well as a few bunches of kale, a signal that the fall crop is on its way. I held off on the pumpkins and winter squash, but they’ll make their way to the table soon enough. Autumn is heading our way, but it’s not here just yet, leaving me plenty of time for a sweet corn soup with fresh pesto biscuits. Last week, my boss popped his head in my cube and asked if I wanted some shiitake mushrooms. Yes?? Turns out his father (a fantastic Minnesotan who grows wild rice and makes his own mead) inoculated a bunch of mushroom logs at my boss’ house. Ready to harvest, he was overrun with mushrooms. Hence a plastic grocery bag full of shiitakes–jackpot! Tonight, it was slightly cool–definitely warm enough to sit outside, but a sweater was needed. 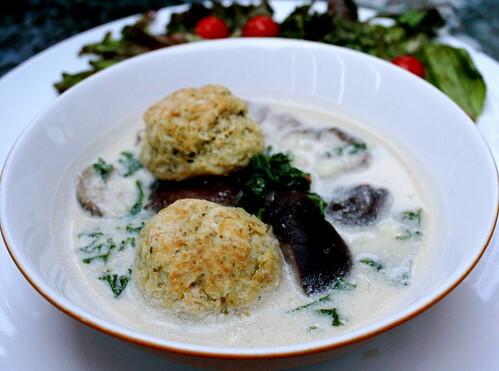 Perfect night for soup, especially one that melds to the two seasons–corn and kale, shiitakes, biscuits streaked with pesto. Everything warm and cozy, but with summer’s flair. Pumpkins, I’ll get to you soon. After another bowl of this soup, perhaps? Cut all of the kernels off the ears of corn and set the kernels aside. In a large stock pot, add the vegetable broth, water, and the six kernel-less corn cobs. Bring to a boil, then simmer for 30 minutes. Meanwhile, prepare the mushrooms. In a skillet, combine the shiitake mushrooms with the red wine, soy sauce, maple syrup, and aleppo pepper. Cook over medium heat until the mushrooms have absorbed all the liquid. Remove from heat and set aside. In a food processor or blender (have I gushed enough about our Vitamix? For reals, couldn’t believe how silky the puree was! ), combine 2/3 of the corn kernels with the can of coconut milk. Blend until smooth. After 30 minutes of simmering, remove the corn cobs from the stock pot. Add the corn-coconut puree, corn kernels, and shiitake mushrooms. Chiffonade the kale and add to the pot as well. While the soup is simmering, pre-heat the oven to 425 degrees Fahrenheit, and prepare the biscuits. Add the flour, baking powder, salt, and Earth balance to a mixing bowl. Using a pastry cutter, blend the butter into the flour mixture until it is grainy with small pebbles of Earth Balance. Add the pesto and cut into the mixture. Slowly add the soy milk (you may only need 1/3 cup, you may need more) and stir into a slightly sticky but stiff dough (you don’t want it to be too sticky or like a batter). Flour the counter and roll out the biscuits to 1 inch thickness. Cut into desired shapes. Bake for 10-12 minutes, until golden brown on the bottoms and slightly browned on top. A polenta biscuit would have been perfect–definitely do it! I think I’ve definitely seen UK websites with Aleppo pepper but can’t think of one now (of course). It’s my go-to a little bit of heat spice! I really love the sound of pesto biscuits. I’ve only tried a rather plain biscuit recipe once before which I found quite boring but adding pesto to them is a great idea. This may inspire me to make biscuits again! i still get confused with what you call biscuit and what we do : ) I was expecting something flat and crispy! I guess we would call these mini-scones..? I love the idea of mini-scones! 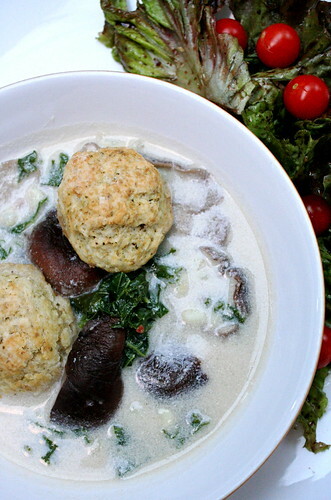 Pesto biscuits with this soup recipe is pure genius, Jes. I’ve always got leftover pesto in the fridge and this is a great way to use it. Bet they would be good in cream of tomato soup!